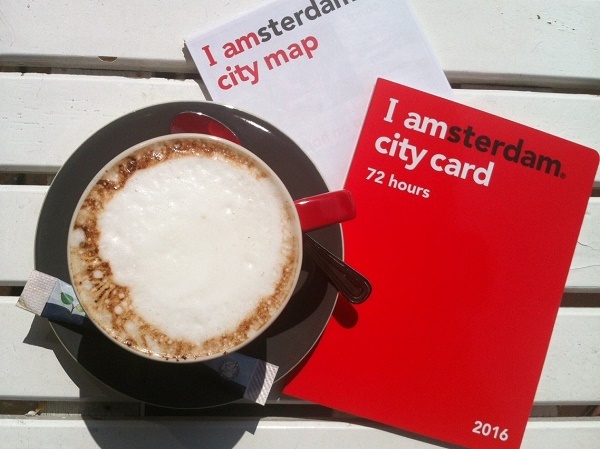 Have you already heard about I amsterdam City Card? Well, what most people know is that it gives you free access to 40+ museums, the city’s top attractions and free public transport in Amsterdam. However there are still a few not widely known things that will help you benefit from I amsterdam City Card. Check out our review! What is included into I amsterdam City Card? From 2018 entrance to the Rijksmuseum is also included in I amsterdam City Card. Please note that if you want to visit All the Rembrandts exhibition (from 15 February through 10 June 2019) you need to book a time slot at the museum’s official website. For the Van Gogh museum you must book a time slot on I amsterdam official website. To book a time slot at the Van Gogh Museum you need to have your City Card on hand. I amsterdam City Card is available in 5 options: for 24, 48, 72, 96 or 120 Hours. On I amsterdam official website you can check what’s included in I amsterdam city card. And we’ll focus on the card’s hints and hidden treasures, that will make I amsterdam City Card totally worth the money you play. So, what is good to know to make I amsterdam City Card absolutely worth it? Though some people mistakenly think that I amsterdam City Card is valid for 1, 2, 3, 4 days, it is valid exactly what the number of your card says: 24, 48, 72 or 96 hours. So if you activate your card on your first day, let’s say, at 11:00, it will still be valid till 11:00 on the day after the last one. You can use this trick and for example, enter the Artis Royal Zoo at 10:30 and spend half of the day there. The City Card contains two elements – one for GVB public transport, the other one for museums, attractions and a canal cruise. They are both activated automatically: the transport element at the moment you first use tram, bus or metro. The museum element – the first time you visit museum, attraction or take a canal tour. Keeping this in mind, you can plan your agenda correspondingly to get the best out of your 24-96 hours in museums and in public transport. You will find a full list of free giveaways in the brochure that goes with I amsterdam City Card. They include free walking tour in Volendam, free walking tour brochure in Enkhuizen, free set of postcards (actually, two cards – they give you one and you can pick one more yourself) in Haarlem tourist information office. The most mysterious giveaway listed in the brochure is a gift in De Bijenkorf luxury shopping center. 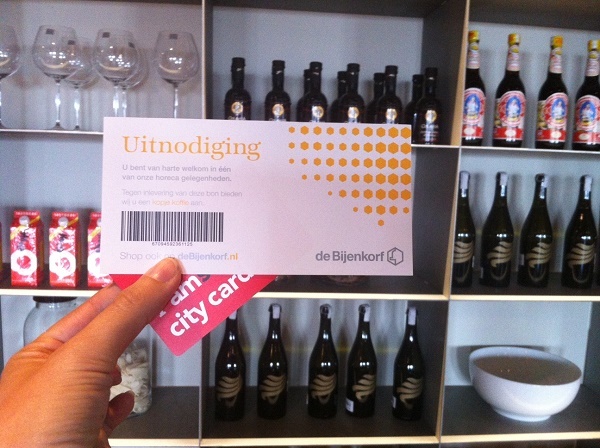 We’ve checked it – and the gift was a coupon for a free cup of coffee or tea in De Bijenkorf self-service restaurant. It was good to have a coffee break! In general, I amsterdam City Card does NOT give you free travel by train or direct Amsterdam Airport Express bus (bus №397, which is operated by Connexxion company). BUT here comes the trick: you can still travel to/from Schiphol with GVB transport. If you are travelling from Amsterdam to Schiphol, take a tram №2, which departs from Amsterdam Central station. Ride to Antwerpenbaan tram stop (it will take approx. 40 minutes). Here you need to switch to GVB bus №69, direction Schiphol Airport/Plaza, which will take you to the airport in 12 minutes. You can order your I amsterdam City Card online, pick it up in Schiphol or near Amsterdam Central station and start using it immediately. Amsterdam Central Station: I amsterdam Store, on the North side of the station. Open Monday – Wednesday: 08:00 – 19:00, Thursday – Saturday: 8.00 – 20.00, Sunday: 10:00 – 16:00. Amsterdam Airport Schiphol: I amsterdam Visitor Information Centre Amsterdam Schiphol Airport, Arrivals Hall 2: Holland Tourist Information. Open daily from 07:00 to 22:00. Amsterdam Central Station: I amsterdam Visitor Information Centre at Stationsplein 10 (on the square opposite the main station entrance) Open Monday – Saturday: 09:00 – 17:00, Sunday: closed. Is de Amsterdam City Card geldig vanaf het Centraal Station naar het Corendon Village Hotel Amsterdam, Schipholweg, Badhoevedorp en later van het hotel naar het centrum van Amsterdam? I amsterdam city card is valid only in transport operated by GVB company. Please check 9292.nl journey planner to see what company operates on your desired trajects. If I buy the city card only but can’t activate it until my arrival in May, how can I make time slot reservations for the Van Gogh Museum and Rijks? Is it better to get the museum card if only use it for 5 museums? With I amsterdam city card you do indeed need to make time slot reservations at the Van Gogh Museum and Rijksmuseum. 1. 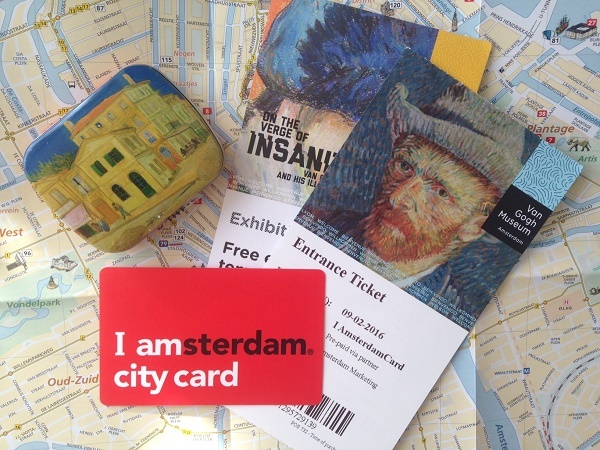 For the Van Gogh museum you need to have the City Card on hand. Reservation can be done via this link. 2. For Rijksmuseum you do not need to have the card on hand. Reservation can be done via the museum’s official website. The Van Gogh Museum time slots are almost fully booked for this period. There are a few time slots still available, but you’ll need to reserve one quickly to secure a spot. Occasionally, time slots open up at the last minute, so we recommend checking just before you come to Amsterdam. Do you need to book any museums ahead of time? (Except for Van Gogh and Anne Frank) I’m a little confused because on the iAmsterdam site, for some of the museums, it says ‘book tickets now.’ Is this necessary?